A great addition to the series. oint Lookout, just as previous DLC content, adds plenty more to enjoy in the Fallout universe. Things begin quite simply. You get notification that a riverboat has shown up on the Potomac River with the enticing lure of taking people to a new place full of adventure. Those who are up for a change in scenery will be approached by Catherine — she's looking for her daughter, who seems to have gotten tired of life at home and run off. This brief encounter is what sets off what ends up passing as the main story for the new content. quite a few secrets.I was quite disappointed with the main quest this time around, mostly because outside of the first initial battle it felt very much like a side quest. Not that that's a bad thing — but when compared to the other side quests that are available in Point Lookout, it's just not as exciting. The main story line should be what drives you to check out the whole area and everything else the content has to offer, and I feel that this element was lacking this time around. The only time things get particularly interesting is when the Vault dweller begins to hallucinate after getting sprayed with a mysterious substance. I won't go into details and spoil the experience but that section was very well done. Going back to the other quests that are available, there is a wide range of things to do — from finishing off the mission of a long-gone Chinese double-agent to a feral ghoul Safari, you have some very interesting options open to you. What's distinct about Point Lookout is that for the first time with any of these new content packs, I felt like I was exploring the Capital Wasteland again. There are new areas to explore, and quite a few secrets to find out in the swamps. The feel of the new environment feels like a combination of Oblivion and Fallout. If you're like me you'll be spending a good deal of time wandering around among the trees in the swamp, while looking for traces of ruined civilization. open to you.Really, that's where the magic of this new content lies — in being able to explore a new dangerous area and not feel like you're playing against the rails of the main storyline. Even after you've taken the time to do all of the new quests that are available, there will still be plenty to explore as the quests don't take you everywhere that you can travel to. Similar to the previous content packs new weapons, clothing and enemies are included, as well as some new items. You'll run into all of these new additions one way or another. Whether by following quests or just going out into the swamp, you'll find something new and dangerous out there. I have only one minor issue with the new items: you'll find them everywhere, even in places where you don't expect them to be. I personally find it very hard to believe that people kept bags of yeast locked up in safes before the Great War; it's that kind of surrealism that throws off the immersion a bit. 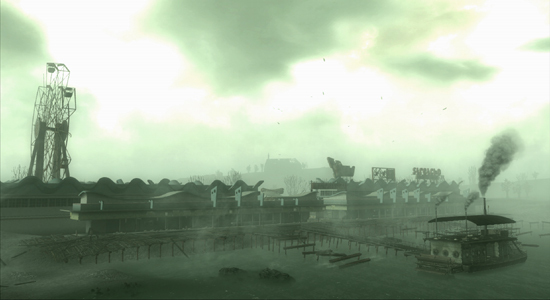 Outside of that, Point Lookout is a great addition to Fallout 3 — definitely something to download if you want a large new area to explore or are still going through the main game. © 2011 Game and Player. All rights reserved. All other trademarks are trademarks and/or copyright of their respective owners. Site best viewed without Google Chrome.